Zynewave has updated Podium to v2.36 and Podium Free to v2.34. Added an "Appearance" page to the preferences dialog. It includes new settings for default button size, button and slider knob roundness, and various other options. The Podium default is updated to use a button roundness setting of 50%. Added a shortcut for setting the default button size directly in the Podium UI: Place the mouse cursor over the project window menu bar, hold the Ctrl key down, and use the mouse wheel to adjust the overall button size. The entire UI will scale in realtime. The mixer horizontal zoom can now extend down to 20% of the normal strip size. When zooming below 100%, the various mixer controls will change position and size to accommodate for the narrow mixer strips. Double-click or Ctrl+click the zoom slider to set zoom to default. Double-click again to restore previous zoom setting. Dragging the mixer zoom slider will lock the zoom on the focus track. 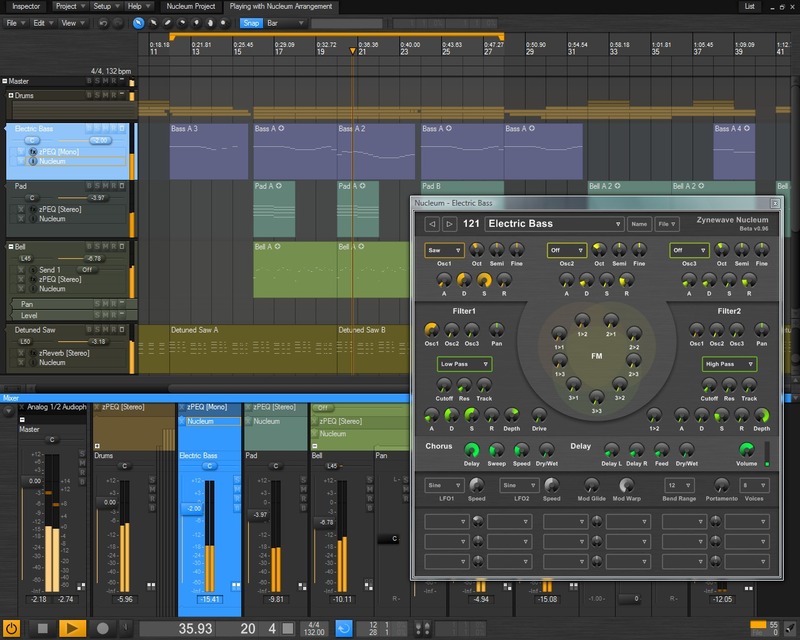 The arrangement editor zoom and slide tools can be used on the mixer strips. To zoom in/out on a specific strip, hold Ctrl+Alt and use click+drag or the mouse wheel over the strip. To slide the strips, hold Shift+Alt and click+drag, or hold Alt and use the mouse wheel. Optimized the code for realtime UI animation. The animation of the play cursor, meters and other indicators will continue when for example scrolling the mixer strips, dragging windows, opening menus in plugins, etc. 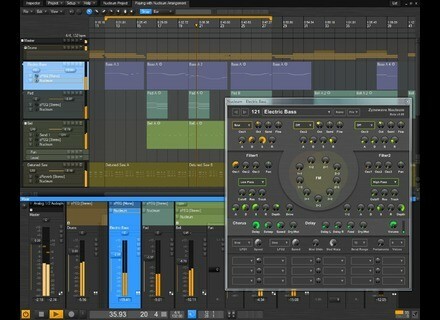 Bounce enabling a track will create a dedicated bounce track in the effect chain, instead of enabling bounce mode on an existing effect track. The bounce track will show up with a "Bounce" button in the chain, which can be clicked to open the bounce menu. The bounce extraction point can be set by dragging the bounce track up or down in the chain. Updated the "Tracks", "Track Inspector" and "Mixing" chapters in the Podium guide. MIDI files can be auditioned in the browser. The MIDI file will play on the focus track, at the tempo of the arrangement. If the arrangement is playing, the "audition on bar start" option will sync the MIDI file to the arrangement. MIDI files can be dragged directly onto the note editor timeline. This will insert the notes from the MIDI file at the mouse cursor timeline and root note position. All inserted notes will be transposed to use the new root note. Holding the Alt key will drop the notes without changing the root note. Added "Export Selection to MIDI File" command to the File menu in note and curve editors. Pressing the Insert key in the arrangement and note editor now supports duplicating a multiple event selection. If snap is enabled, the duplicated events will be snapped relative to the next grid line. Pressing Shift+Insert will override snap. Pressing Ctrl+Insert will snap to next bar. Realtime bounce recording mode automatically creates the sound events for the recording. Realtime bounce recording is no longer limited to the length of the arrangement. It will continue to record until stop is pressed. Updated the "Toolbars", "Sliding & Zooming", "Recording", "Preferences" and "Colors" chapters in the Podium guide. Rewritten the "Getting Started", "Projects", "Project Window", "Project Start Page" and "Browser Window" chapters in the Podium guide. Added "Refresh file list" button to the file browser toolbar. Added "Explore Folder" to the file browser menu. The command opens a Windows Explorer for the folder shown in the Podium file browser. Time-stretching is now supported for note and curve sequence events on tracks. Hovering the mouse over a sequence event will show two new stretch drag handles above the resize drag handles. Dragging the stretch handles will compress or expand the playback of the events within the sequences. Stretching will not affect the events within the sequences, so you can use phantom copies of the same sequence, each with a different stretch factor. Added "Tap Tempo" button to the tempo event dialog. Sonic Reality Neil Peart Drums Vol.1: The Kitdelete Sonic Reality has announced the release of Neil Peart Drums Vol. 1: The Kit, a music software recreation of the DW drum kit of Rush drummer Neil Peart.